You can easily change the arrangement of the Playlists within a Playlist Folder to suit you requirements. You can arrange Playlist within your Playlist Folders to either find specific Playlists in your Folder without publishing the arrangement to your Live Player or you can save the arrangement which will change the currently published Playlist Player immediately to your saved changes. If you want to check out some demos and and extra information please visit our Playlists information page. 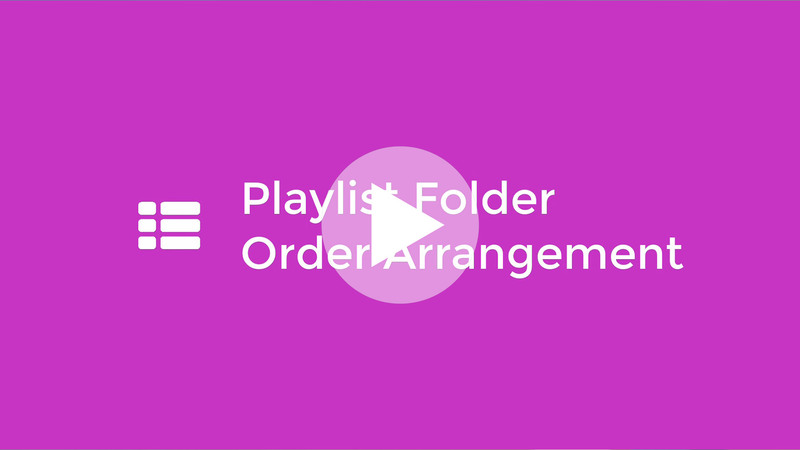 To arrange the order of your Playlists within a Playlist Folder simply select the your desired ▼ Playlist Folder from the left hand navigation panel. In the central management panel you will now see a list of all the Playlists within your chosen Playlist Folder. Simply hovering your mouse pointer to the left side of any Playlist you would like to rearrange. This will change the pointer to a ⫶⫶⫶ Move Cursor. Now left click and keep the mouse button pressed whilst dragging the Playlist to your desired location within the Playlist Folder. When the Playlist is in the desired location, simply let go of the mouse button and the Playlist will snap into place. Once you have arranged all the Playlists the way you want them to, simply click on the green ✔ Save button located on the top right hand side next to the Arrange By: section. This will save your currently chosen arrangement and will reflect on your published player immediately. You can automatically arrange a list by selecting one of the tabs located at the top. Once you have arranged all the videos the way you want them simply click on the green ✔ Sort by button located on the top right hand side next to the Arrange By: section. You can return to your currently saved Live Arrangement by clicking on the Live Media Arrangement By: Value next to the green Sort By button. If you don’t save your arrangement and leave the current Playlist Folder view, then return you will be shown the current Live Arrangement of the published Player.